“Since then we have a great high priest who has passed through the heavens, Jesus, the Son of God, let us hold fast our confession. For we have not a high priest who is unable to sympathize with our weaknesses, but one who in every respect has been tempted as we are, yet without sin. 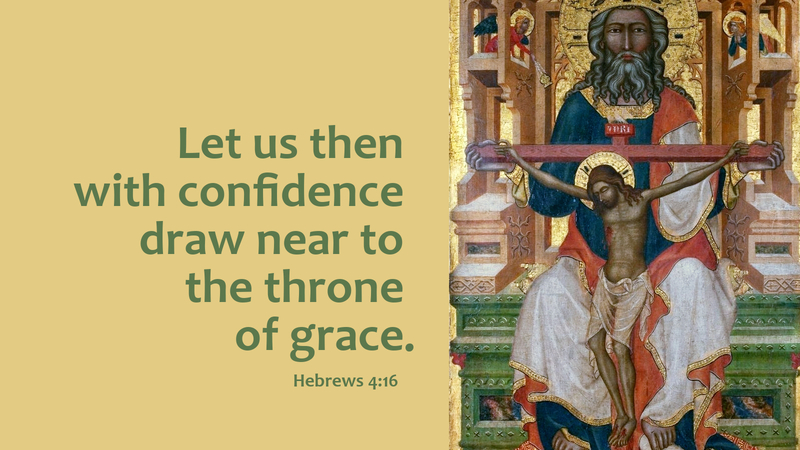 Let us then with confidence draw near to the throne of grace, that we may receive mercy and find grace to help in time of need” (Hebrews 4:1-16). For many of us, this is indeed a time when we need to draw near to the throne of grace to receive mercy and find grace to help. We have now not only completed our Lenten journey, but we have walked with Jesus all the way to the cross, and witnessed Him buried in the tomb. And now, Holy Saturday leaves us feeling alone. Though we know what will come with the morning, still our hearts can be troubled. But it is Jesus, the Son of God who has passed through the heavens, the once-for-all sacrifice who entered into the holy of holies, to pay the price, to make atonement for our sins, that we might approach the Father, not in fear but with confidence that the way to Him is open—not because of who we are, or what we have done or failed to do—but because Jesus Christ is our Great High Priest! Now sin and death have been overcome by the one who has been tempted as we are, yet remained without sin. Now we can draw near to the throne of grace because our Great High Priest has made sacrifice for us. Now we need no longer fear God, or death, or hell, for Jesus Christ has opened the way to heaven for us. While our joy may be restrained for one more day, we know what’s coming. We know that resurrection and new life come with the new day! Prayer: Lord God, on this day when our Lord’s body lay in the tomb, give us time for rest and reflection, silence and prayer, that the full meaning of our redemption will settle upon our hearts and minds, as we prepare to celebrate the Easter feast; through Christ our Lord. Amen.